After you’ve purchased your ticket, you take a glass lift down to the ground level. Have your camera ready to capture the lovely view you get of the little valley below. 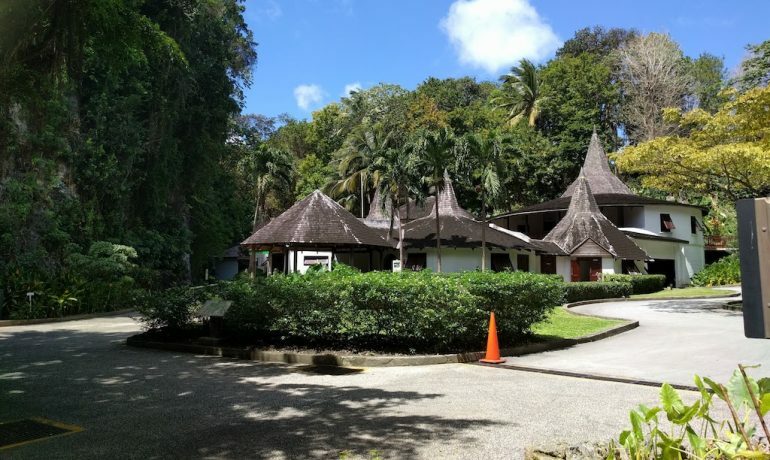 The visitor centre building is located in a garden, which showcases the different flowers and palm trees found around the island. 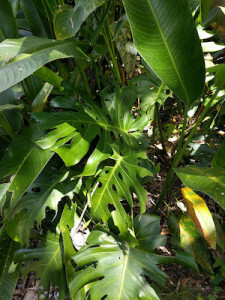 My favourite is probably the Swiss cheese plant, which can be recognized by the naturally occurring holes in the leaves. 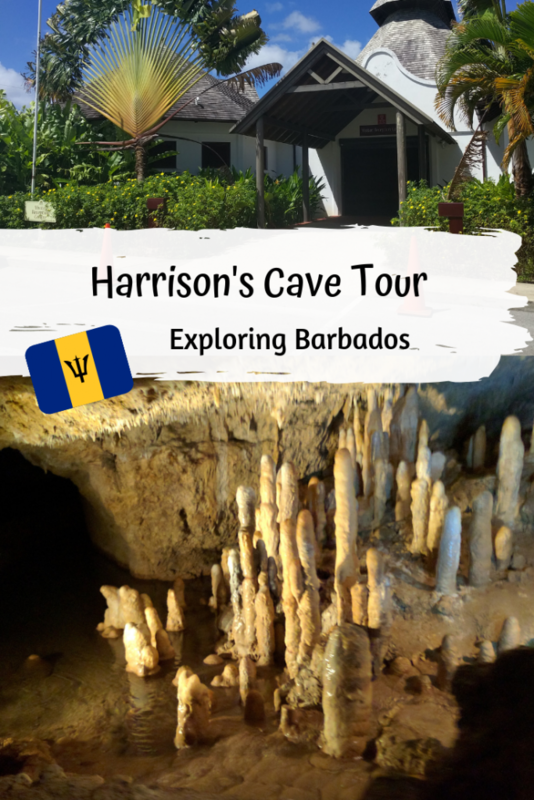 Before the tour starts you get to walk around the museum part, which gives you details about why the cave came to be called Harrison’s cave and how it was discovered. Mentioned in documents as early as the 18th century and probably known to people before, the extensive cave network was only explored and documented relatively recently in the 1970s. The little museum also explains how the caves and in fact the entire island of Barbados came to be. If you are able to remember all the details about sediment layers, you will be able to explain to people back home why there are no volcanoes on Barbados like there are on many islands in the Lesser Antilles. If you don’t like reading all the information and infographics, there is a short film, which gives you a summary of all the information. The tram on which you are driven around the cave, reminded me of the type of roller coaster, which is made for children and people who really don’t like roller coasters. Although you go up and down as you make your way through the vast caves, it’s not scary and you don’t need to worry about your stomach getting upset at all. You also get the opportunity to get off the tram and walk around at certain points during the tour. Just make sure not to touch anything, since the natural oils of the skin could cause the stalactites and stalagmites to stop growing. 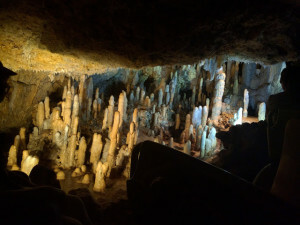 As the entertaining tour guide takes you through the caves, describing in detail how the explorers documenting the caves must have felt without the artificial lights, you see a wide range of stalagmite and stalactite formations. There are smaller ones, just a couple of inches long, up to stalagmites rising from the ground like towers. They all have names like the altar scene or the Great Hall. But you can let your own imagination play and see what scenes or figures you spot in the formations. Harrison’s Cave is on the list of many visitors to the island. Almost everyone on the island would have visited at least once, creating fond memories from school trips as a child. The attraction has been through several improvements in the past decade (I won’t spoil the surprise). 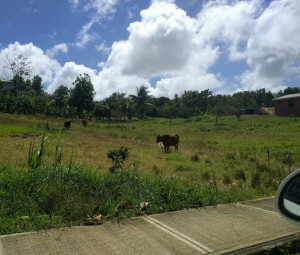 Bajans are welcome to check it out, it’s even more amazing than you remember it from your childhood. Tour operators are fun. They can easily tell you’re a local if you’re wearing long jean pants in the heat and will even make jokes in Bajan. If you see someone chuckling at something a tour operator said (that you can’t understand), that’s a Bajan. You’re probably thinking you should dress warmly if you’re going into caves underneath the surface. However, the average temperature is a cosy 27°C, so no need to carry an extra jacket if you’re fine with those temperatures. The areas where you can walk around are flat and therefore as accessible as walking on a paved sidewalk. 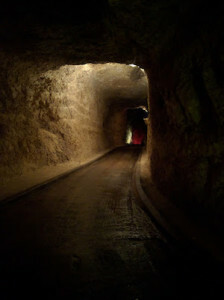 If you are looking for a more adventurous tour, you should look up the guided tours, where you explore the caves on foot.